Before using “Convert to PCB”, “Update PCB” in Schematic and “Import Changes” in PCB, please read Essential Check Before Clicking “Convert to PCB” or “Update PCB” or “Import Changes” section. Sometimes, while working on a project, you need to make changes to the schematic and then update your board, to incorporate them. It’s easy to do this with EasyEDA. 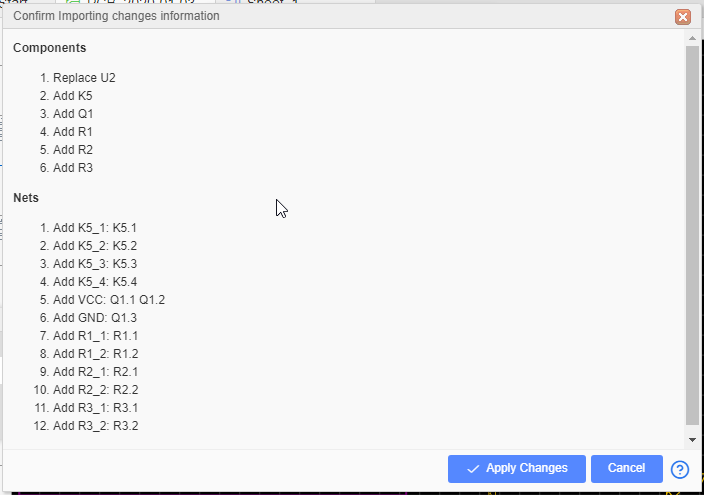 If you are happy with your changes, just click the Apply Change button. The changes will then be passed into the PCB layout and you can then adjust the tracking to suit. Notice: The prefix and name of the footprint on the PCB, must the same as the part’s on the schematic, otherwise it will be removed and place a new one when Import Changes. 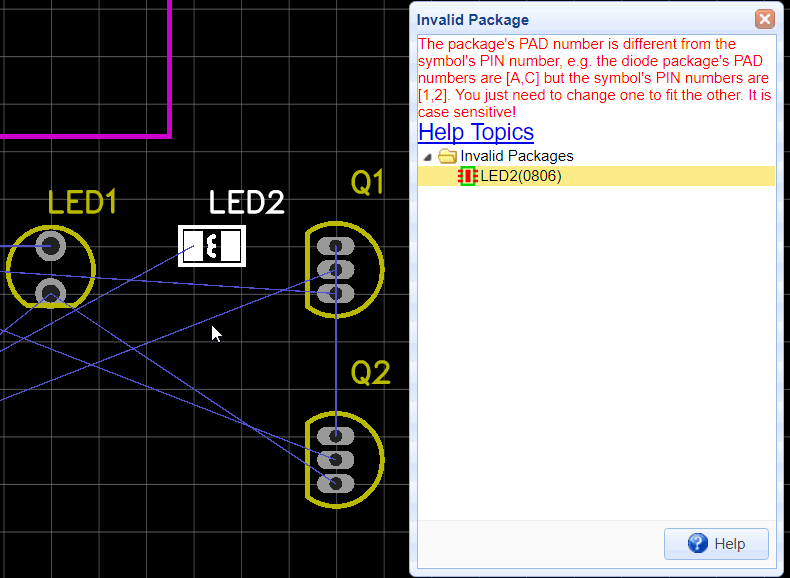 Sometimes, when you try to convert a schematic to a PCB, you will get an error message dialog like below. Don’t worry, it is easy to fix this problem. 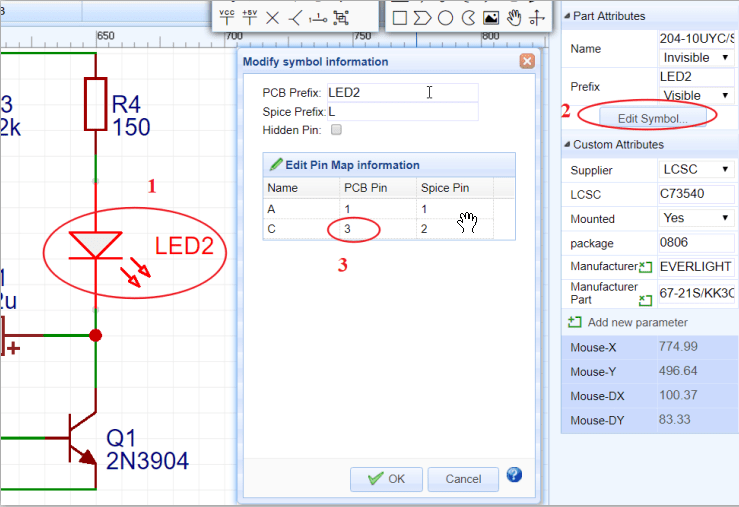 From the image, we can get the PIN number in the schematic symbol is set as 3, but the PAD Number in the PCB Footprint is set as 2. Now that we’ve found the problem, how to fix this? Solution One: Change the schematic symbol’s Pin number. Using PinMap function. Change the PCB PIN from 3 to 2. And save your schematic , and update PCB. Solution Two: Modify the Footprint’s pad number. Edit the Footprint, change the PAD from 2 to 3. 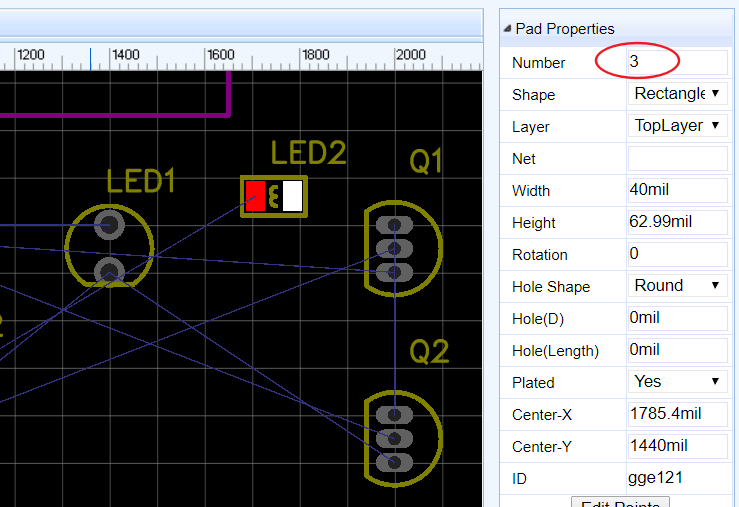 And set this PAD net name to be the same as LED2 net name in the schematic. So, we should be aware that PIN number should be the same as Pad number. If your footprint just a logo, please ignore this error.